The 'pearl oyster' is a marine bivalve mollusc of the family 'Pteriidae'. It has a natural procedure to protect itself from foreign substances. 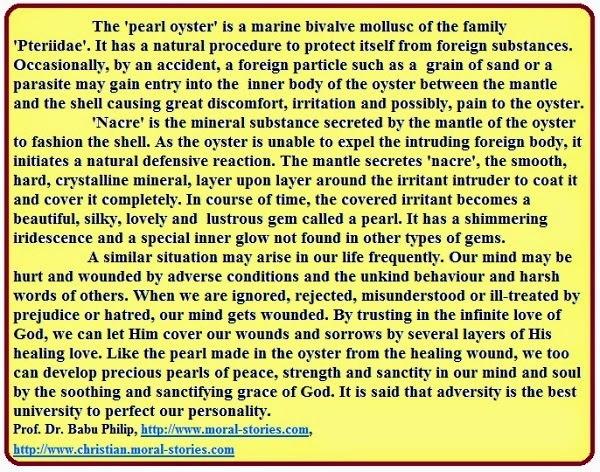 Occasionally, by an accident, a foreign particle such as a grain of sand or a parasite may gain entry into the inner body of the oyster between the mantle and the shell causing great discomfort, irritation and possibly, pain to the oyster. The coating of nacre consists of microscopic crystals of calcium carbonate, aligned perfectly with one another so that light transmitted along the axis of one crystal is reflected and refracted by another to display a spectacular spectrum of light and colour. A similar situation may arise in our life frequently. Our mind may be hurt and wounded by adverse conditions and the unkind behaviour and harsh words of others. When we are ignored, rejected, misunderstood or ill-treated by prejudice or hatred, our mind gets wounded. Our life is like a boat, sailing through the sea of the world. We may be threatened by the tempests of troubles, tribulations and temptations. But we can sail safely if our faith is strong. God has control over the forces of nature. He may give us tests and trials so that we may grow further and stronger, but he never abandons us during hard times. God is with us in our joys and tears throughout our life. God has plans to bring to us prosperity and not disaster.